I’m a beginner - which reeds should I use? For an economical beginner reed, try the Oxford reed (medium-soft strength). For a reed with better tone try the Paris reed (medium-soft strength). I'm not a beginner - which reeds should I choose? Please click here to get advice. You should always have a spare reed in case the one you’re using gets damaged or too old and unresponsive. I normally recommend buying at least 3 reeds so that when the first one is no longer usable, you still have a spare, and you then have time to order some more. Of course, we regularly have special offers, discounts or free reeds, so look out for these offers which may be on this website, or sent to you through the post or email. Note: If you order Recanes (instead of new reeds) you will need to post us your old reeds for re-caning before we can send your recanes order. How are my reeds packaged? W e use our own style of cardboard box which has been carefully designed to allow the reeds to "breathe" whilst being lightweight and protective. To open it we recommend you carefully use a craft knife to cut the tape on the edges, and unfold the flaps carefully. If you are not used to handling sharp knives we recommend you ask an experienced adult to carefully cut the box open. How should I take care of my reeds? Firstly, keep them in a proper reedcase. 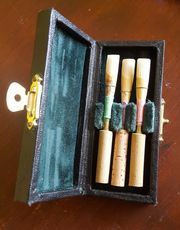 Reedcases can seem expensive at first but a reedcase for three reeds only usually costs about the same as a couple of reeds and it can save damaging many reeds. You should never keep them in the plastic tubes that some reeds are supplied in - this doesn’t allow them to dry out and can cause mould to grow on the reed. If you can, always soak the reed in clean water before playing it. If you always use your saliva alone to soak it whilst warming up, the many chemicals in your saliva will be absorbed into the cane, and the reed will thicken up more quickly. Ideally always rinse the reed in clean water after you’ve finished playing. This can be done by running tap water through it whilst holding it upside down under a tap, or by carefully swishing the cane part in a small pot of water. This helps prevent the build-up of dried saliva which otherwise will occur on the surfaces of the cane. If you have to store the reeds for a long time, try to ensure they are not in a humid or wet environment. Normal indoor room air is perfectly suitable within the UK. What's the best way to test my reeds? 1. Hold the reed only by the cork or the binding thread part - don't hold it by the cane part. 2. When you first receive the reeds, soak the reed blades in clean water for at least 1 minute before playing. 3. Blow the reed on it's own (without the oboe) and check it responds ok. If the reed is too hard at first, soak the cane part in warm or hot-tap water for 3 minutes then try it again. 5. Make sure the reed is pushed FULLY into the oboe before you test it (if it's not all the way in it will play flat and some high & low notes will not work properly). This may seem unlikely but it is very common for players to forget to check this with new reeds which are often stiffer to get all the way into the oboe). 5. Check the response first - does the reed play easily enough on mid-range notes (first octave G - C). Then try all other notes high and low, sensing for how responsive the reed is. 6. Continue playing now listening to tone to check if this is suitable for you. 7. TRY BOTH SIDES - turn the reed around in the oboe and try the other side. Each side of the reed will play slightly differently and when you've decided which is best, mark the top of the cork on the side that faces you with a small dot, so you can put it in the oboe the right way round next time. New reed too tight for the oboe? This sometimes happens with new reeds. Don't use cork grease or you will find the reed difficult to remove (too slippery!). It is best NOT to sand the cork down as this may create flat spots and cause the reed to leak around the cork. A better result is easily got by rolling and squashing the cork. Place the reed on a firm table with the tip of the reed hanging off the side of the table. Holding a reedcase or similar hard flat object, place the reedcase over the cork part of the reed and roll it back and forth ten times whilst pressing firmly down onto the cork. Then try the reed in your oboe. It should be noticeably easier to fit in as you have compressed the cork a little. If it is not compressed enough after this, repeat the process until the reed cork is compressed enough to slide comfortably into the oboe. You should only have to use this method the first time. They are made from natural cane so it varies quite a lot. As a rough idea, I would say about 10 hours of playing ON AVERAGE. Some may last for only four hours, some may go on well beyond twenty hours. The tips of my reeds seem to break or split after quite a short time. Why? If you are a new player this may be because of accidental damage. The tip of the reed is only paper-thin, and very delicate. Just lightly touching the reed can cause damage. 1. Always keep the reed in your visual field (within eye-sight). Many beginner players often look down at the instrument to see where their fingers are supposed to go. When doing this most people will tilt the oboe towards them and the reed may touch their shoulder (they won’t necessarily feel it happening). So instead, get used to TURNING the oboe TO THE SIDE if you want to look at your fingers - and you should be able to see the reed (at least in the corner of your eye) at all times. 2. Stick your tongue out. It’s not rude, it’s just what players do. When you’re putting the reed in your mouth, avoid accidentally hitting your teeth and breaking the reed. Stick you tongue out, lay the reed on your tongue, and then let your tongue bring the reed into your mouth. This way you will never hit your teeth. Why do most oboe reeds have a wire wrapped around them? I seem to play sharp all the time. 1. If the breath support is not great the player will tend to inadvertently pinch the reed a little more in order to make it speak and hold its pitch. After a while this playing "position" can become such a habit that the player is unaware they are doing it. One key indicator of this situation is a tendency to close up the reed after it has been played for a while. The remedy is to use a newer reed which still has a reasonably open aperture, take a very deep breath to stimulate effortlessly strong breath support, and play a long note. As soon as the player has settled on the note, they must start to lower the jaw to loosen the embouchure. The pitch should lower, the reed resonate more freely, and the tone become more mellow. In this case this exercise proves to the player where the problem stems from, and helps them see how to practise to re-adjust (which is mainly to use long-note practise with a tuner and the above method). 2. The player may have unusual mouth and/or nasal cavity dimensions and so play sharp on every reed/instrument combination. This is rare. One solution is to try a wider reed (eg. Blake, Minster, Berlin, Kavinski). This may solve the problem, in which case look no further. However, changing to a wider reed also changes the tone colour and pitch stability so you may not find this comfortable. If so, you will perhaps need to keep the same reed you are used to but lengthen the staple to lower the pitch. Longer staples are not generally available so a recommended solution is to have a reed-well insert made. Essentially this is the cut off base of a staple inserted into the reed-well of the oboe so that it sits under the reed, lengthening the staple and lowering the pitch. We can make this for you in a 1mm, 1.5mm or 2mm version. You will need to email or call us to discuss this. 3. The oboe's bore may be warped, or of very unusual proportions. This is very unlikely but could be tested by having another oboist play the oboe (using their own reeds). If the other player (using their own reeds) plays sharp only on your oboe then we would suspect the oboe has a narrow or unusual bore. You may need to have the instrument tested by us. Alternatively you may need to have a reed-well insert made. Essentially this is the cut off base of a staple inserted into the reed-well of the oboe so that it sits under the reed, lengthening the staple and lowering the pitch. We can make this for you in a 1mm, 1.5mm or 2mm version. You will need to email or call us to discuss this. My reeds keep closing up. What can I do? Many players presume they should have a stronger reed, believing that, since the reed cannot cope with the pressures it is being put under, a tougher version is needed. I would not recommend this. This would indeed close up more slowly, but would be harder to blow and to control with the embouchure, so the player would need to work harder generally. It would also encourage a tighter embouchure (when an already tight embouchure may be causing the actual problem). The root cause of the problem is almost certainly with the breath pressure. But don't worry, it should be easily solved. When breath pressure/support is lower, we instinctively play with the reed held more closed by the lips, because only in this more closed position will the reed speak with low breath pressure. Over time, un-noticed by the player, this becomes a habit, and usually players aren't aware they have developed a slightly tighter embouchure and looser tummy when playing. Use a reed which hasn’t closed up yet. Start each playing or practise session with long notes as a warm-up. Any notes will do, but vary them. Take a VERY big breath, start the note and let it settle. Then lower your jaw - keep lowering it, and more and more until air escapes from between reed and mouth. This shows you just how much you can drop the jaw and still get a note. The next time, BIG breath, long note, and this time lower the jaw only until the pitch drops noticeably. The tone should be better, with the reed resonating more fully. This is approximately the playing position you are aiming for. If you can do 10 - 20 long notes during warm-up concentrating on big breath and loose embouchure (lower jaw), you will gradually build this habit into your playing. The only bad (?) news is that I would recommend you keep up this method for ever in order to prevent the natural slip back into bad habits that we all suffer from if we don't keep it up. How do I maintain my oboe? Firstly I’d recommend having it serviced regularly. This means a full general service which involves much preventative maintenance as well as putting faults right. How often you should do this depends on how much you play. If less than 1 hour a day, service it every 2 years. If 1-2 hours a day, service it every year and a half. If you play more than 2 hours a day, have it serviced every year.